Today’s presenter wants to use in his or her meeting the most convenient presentation device possible. 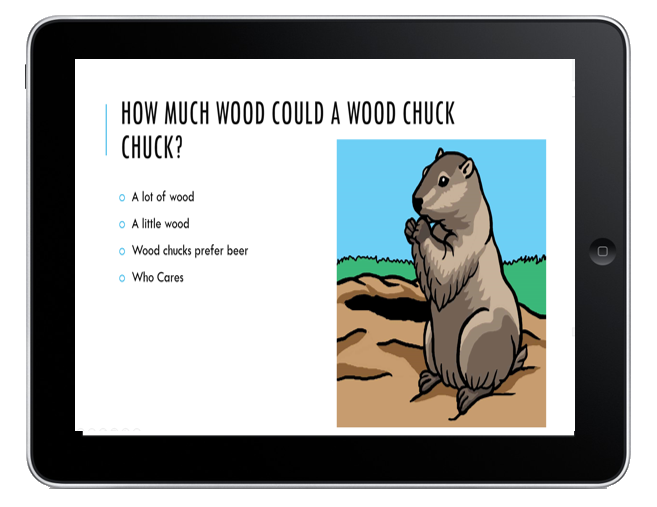 The speaker’s educational content is often carried on an Android tablet or iPad. On the other side of the podium or whiteboard, the audience often carries with them their most convenient, lightest and smallest devices, as well. These iPhones, Android phones or tablets can be used as voting devices instead of dedicated audience response keypads. While clickers are often faster and increase the response rate, they could be more cost prohibitive for certain meetings. With CloudVOTE, a secure and private online content management system, the presentation content can be stored to be used on any device platform. It is possible to use a separate browser window to be projected onto the largest screen available to all audience members, but the presenter with a higher-tier CloudVOTE subscription can also push content to their devices directly. Any combination of web-enabled presentation devices can be used, since all of the content and mobile polling app functionality is accessible through a web browser. The audience can answer the questions with their own mobile devices, or desktop and laptop computers of any model and make. Moreover, with a Wi-Fi base, you can present your CloudVOTE content from an iPad and still use student clickers to vote.